TGIF friends! As I mentioned yesterday, this week was so productive and satisfying. Of course, I’m thankful it’s Friday and we’ve got a good looking weekend ahead of us. Before we get to that though, we’ve got a new Rescue Confessions for you! I’m really excited because today’s rescue pup is a Standard Poodle. His name is Bo and he’s the most handsome devil out there. He’s such a great follow and is doing wonderful things for the rescue community. I absolutely love showing the diversity that the rescue world has to offer. So, let’s meet Bo, shall we? Tell us about your rescue! Name, age, breed, species?? Hi everyone! 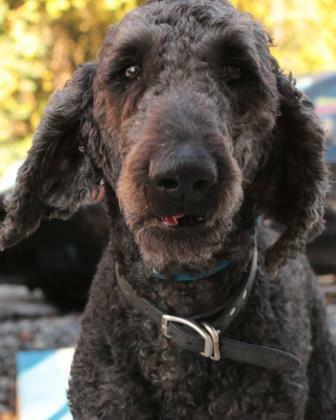 Our rescue Bo is a 6-year-old standard poodle. We rescued him in April 2017 at age 5. Where did you two first meet? Why did you decide to pursue adoption? I volunteer at the Best Friends Animal Society in NYC and am very passionate about animal rescue. So many wonderful animals are mistreated or end up in a devastating situation (e.g. owner dies when the dog is 14 years old and suddenly a sweet senior dog finds himself in a scary shelter). These stories break my heart and I wish I could save them all. How did you know they were “the one” (or two, or three!)? When I saw Bo’s adoption profile, I just loved his sweet face. He came from a home with domestic violence and I really wanted to give him a happy life. Our initial meeting was actually very challenging because the shelter did not have any rooms for a meet-and-greet, so we had to meet Bo outside in the pouring rain. He jumped up on my coat and covered me in mud. I was very worried that my husband was going to say no to the whole thing, but thankfully he decided to give this sweetheart a chance. Now he is absolutely smitten with Bo and can’t imagine life without him. What advice do you have for someone who is deciding whether or not to adopt? Don’t judge a book by its cover! The appearance and behavior of a dog in a shelter is often much different from how they look and act once they are in a safe and stable environment. Bo’s hair was overgrown and he had raging bacterial infections all over his body. We were also told that he had resource guarding at the shelter. The first couple of weeks after we took Bo home were a big transition for all of us. His infections required multiple rounds of antibiotics and trips to the vet, his matted hair had to be shaved off and it took time for him to adjust to the new environment. Bo came from the country and was like a terrified tourist walking around NYC with all of the flashing lights and noise. At one point, he was too scared to pee so the vet had to catheterize him. Even to this day, he still won’t poop on the sidewalk like the other NYC dogs so we have to take a bit of a longer walk to find a patch of grass for him in this urban jungle. 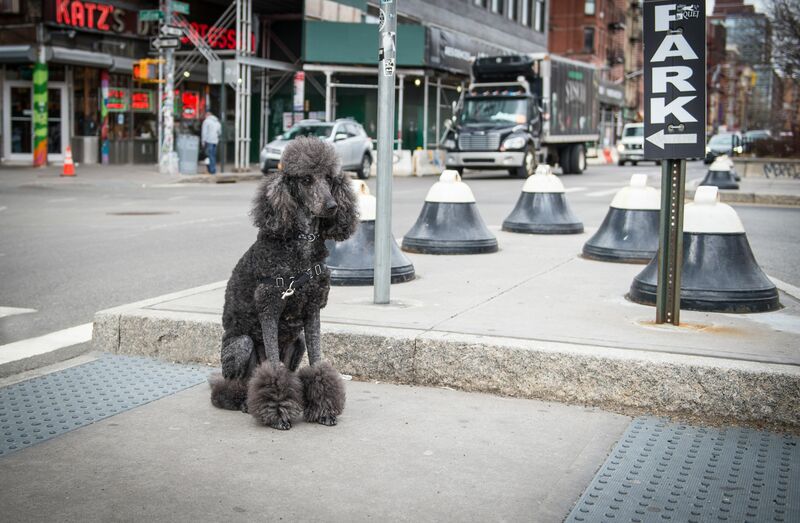 However, with time and TLC, Bo has blossomed into a healthy, happy poodle. 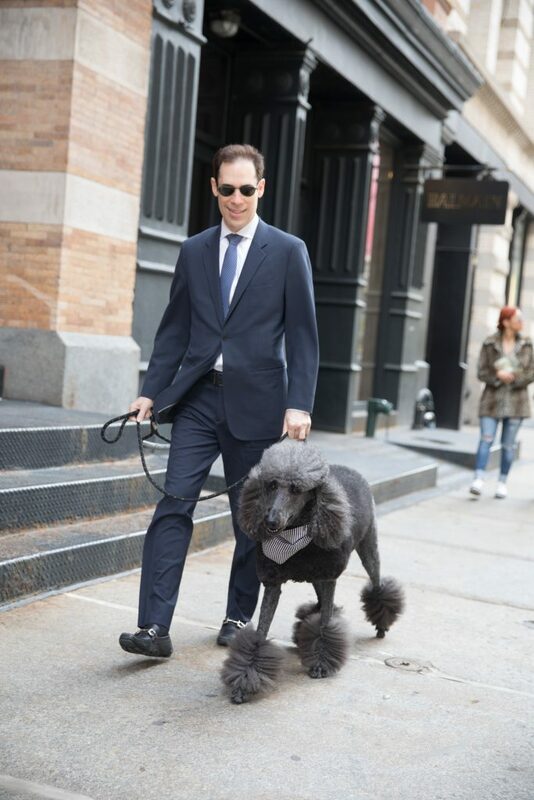 His infections went away, his luscious poodle hair grew in, he loves taking walks all around the city, and the negative behaviors they observed in the shelter were totally gone. The takeaway message from this story is that the beginning has some challenges, so it is important to be patient as the dog settles into their new environment. 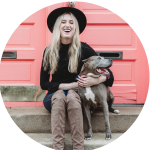 Overall, I am convinced that there is a rescue dog out there for everyone. Puppies are not for everyone (although shelters do get puppies too!) I have a soft spot for the seniors- some really chill, well-mannered dogs wind up in a shelter later in life. These dogs can make very easy pets with minimal exercise requirements and none of the wild puppy behaviors. Anything else you’d like to share (favorite dates/stories/lessons learned)? Our favorite activity is walking around the city with Bo. People are constantly stopping us to take pictures and pet his floofy topknot. 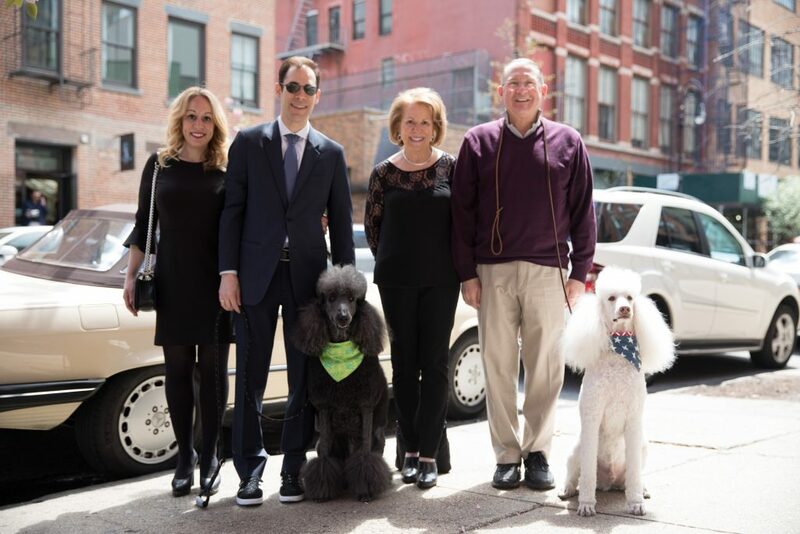 My parents also have a standard poodle (@poodlejake) and when the two of them are together, it’s a real traffic stopper. Bo has had some very special opportunities to appear in several fashion photo shoots and had a feature article in a British dog magazine. We were laughing when his first paycheck came in the mail and wondered if Bo needs to start thinking about his taxes. Anyway, it is really amazing to see how far he’s come in one year and we are so blessed to have him in our lives. Anything furry that squeaks- my current favorites are Pink Poodle and Mr. Unicorn. Pepperoni, salmon, chicken, cheese, eggs… I’m a major foodie. I love the East Village because there are so many dog-friendly places. On weekends, I run around Tompkins Square Dog Park and then brunch with my hoomins at Boris and Horton, the dog cafe! I take up the entire bed so they have no room- they should know better and get me a California King! I hate costumes but the hoomin puparazzi are extremely persistent and I will sometimes acquiesce for treats. I do love bow ties and enjoy sporting those for walks around the city. As Stacy said, I also believe there is a rescue dog for everyone. If you’re willing to be patient and do a bit of research, I have no doubts you’ll find your perfect match. Be sure to follow Bo and his adventures! Tune in next week for another dose of Rescue Confessions! 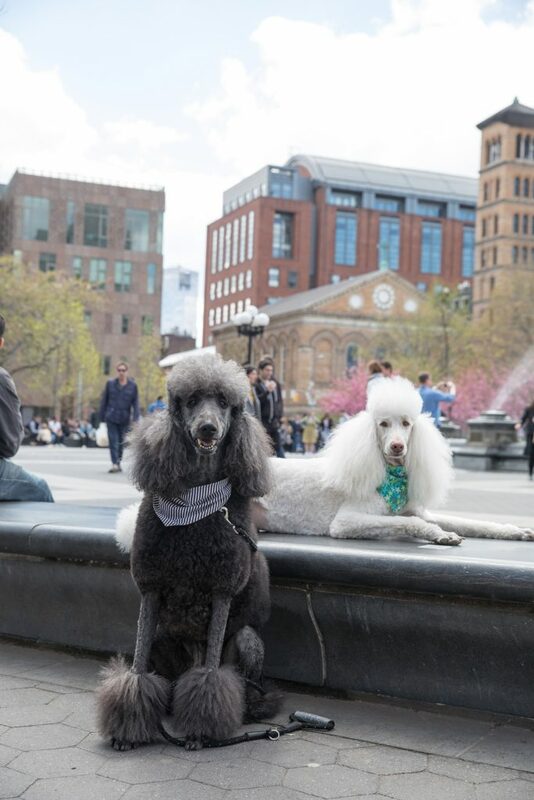 Love the story about a poodle rescue!!! 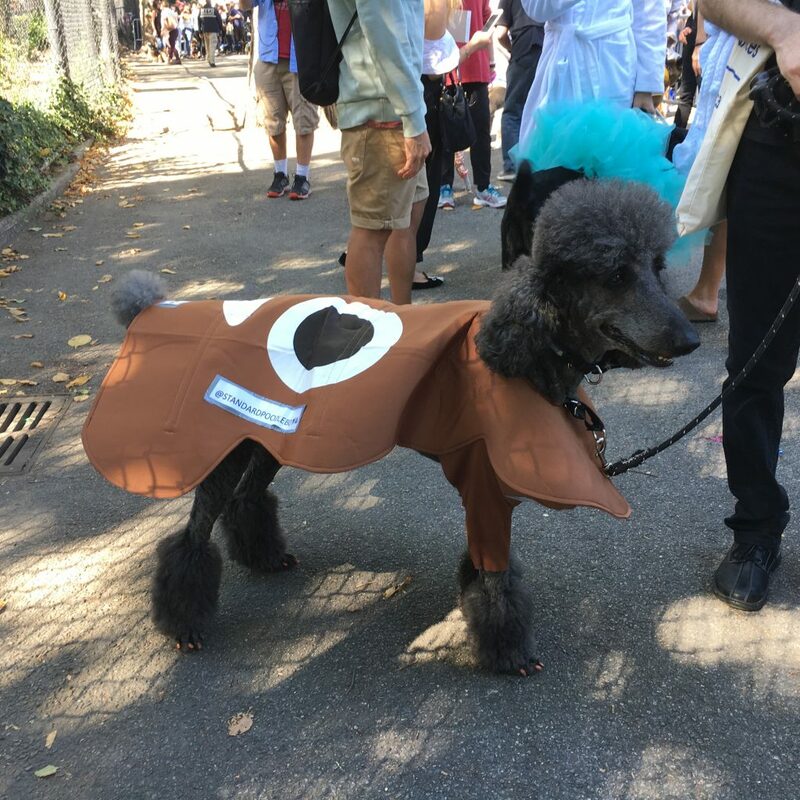 Poodles Rock!! !